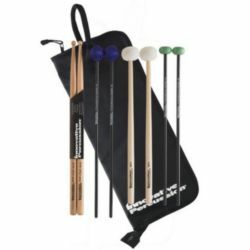 The Innovative Percussion Intermediate Mallet Pack includes each of the following: one pair F2 hard marimba mallets; one pair F9 hard xylophone mallets; one pair CT-3 medium Concert timpani mallets, one pair IP-LD Lalo Davila concert snare drum sticks; and one SB-3 Fundamental stick bag. Innovative Percussion mallets and sticks are sought after by top performers and bands to meet the demands of both indoor and outdoor marching and stage use. Whether you play vibes, marimba, timpani, or drums, Innovation makes the mallets and sticks you need.